The history of the Macedonian dynasty falls into two periods, unequal in significance and duration. The first period extends from 867 to 1025, the year of the death of Emperor Basil II; the second, the brief period from 1025 to 1056, when Empress Theodora, the last member of this dynasty, died. The first period was the most brilliant time of the political existence of the Empire. The struggle in the east and in the north with the Arabs, Bulgarians, and Russians, was crowned with brilliant success for Byzantine arms by the second half of the tenth and the beginning of the eleventh century. This was achieved in spite of some failures at the end of the ninth and in the early part of the tenth century. This triumph of the Byzantine Empire was especially great under Nicephorus Phocas and John Tzimisces, and reached its highest point in the reign of Basil II. In his time the separatist movements in Asia Minor were suppressed; Byzantine influence in Syria was strengthened; Armenia was in part annexed to the Empire and in part reduced to vassal dependence; Bulgaria was transformed into a Byzantine province; and Russia, upon adopting Christianity from Byzantium, entered into closer religious, political, commercial, and cultural relations with the Empire. This was the moment of the highest strength and glory ever attained by the Empire. The intensive legislative work, expressed in the publication of a gigantic code, the Basilics, and a number of famous novels directed against the pernicious growth of large landownership, and the intellectual advance associated with the names of Patriarch Photius and Constantine Porphyrogenitus add further glory and significance to the first period of the Macedonian dynasty. After the year 1025, when the powerful figure of Basil II disappeared from the historical stage, the Empire entered a time of frequent court revolutions and anarchy which led to the troubled period of 1056-81. With the accession of the first of the Comneni, who seized the throne in 1081, the Empire regained its strength. Internal order was re-established, and for some time intellectual and artistic activity flourished once more. The question of the origin of the founder of the Macedonian dynasty has called forth many contradictory opinions, mainly because sources vary greatly on this point. While Greek sources speak of the Armenian or Macedonian extraction of Basil I, and Armenian sources assert that he was of pure Armenian blood, Arabic sources call him a Slav. On the one hand, the generally accepted name "Macedonian" is applied to this dynasty, but on the other hand, some scholars still consider Basil an Armenian, and still others, especially Russian historians prior to the seventies of the nineteenth century, speak of him as a Slav. The majority of scholars consider Basil an Armenian who had settled in Macedonia, and speak of his dynasty as the Armenian dynasty. But in view of the fact that there were many Armenians and Slavs among the population of Macedonia, it might be correct to assume that Basil was of mixed Armeno-Slavonic origin. According to one historian who has made a special study of Basil’s time, his family might have had an Armenian ancestry, which later intermarried with Slays, who were very numerous in this part of Europe, and gradually became very much Slavonized.A more exact definition of the Macedonian dynasty from the point of view of its ethnographic composition might be Armeno-Slavic. In recent years scholars have succeeded in determining that Basil was born in the Macedonian city of Charioupolis. Basil’s life previous to his election to the throne was very unusual. As an unknown youth he came to Constantinople to seek his fortune, and there attracted the attention of courtiers by his tall stature, his enormous strength, and his ability to break in the wildest horses. Stories of young Basil reached Emperor Michael III. 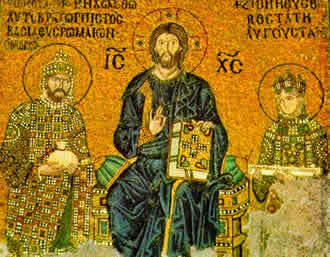 He took him to court and later became completely subject to his new favorite, who was soon proclaimed co-ruler and crowned with the imperial crown in the temple of St. Sophia. He repaid these favors received from the Emperor very brutally: When he noticed that Michael was becoming suspicious of him, he ordered his men to slay his benefactor, and then proclaimed himself emperor (867-86). After him the throne passed on to his sons, Leo VI the Philosopher or the Wise (886-9I2),and Alexander (886-913). Leo's son, Constantine VII Porphyrogenitus (913-59), remained indifferent to affairs of state and devoted all his time to literary work in the midst of the most learned men of his time. The administrative power was in the hands of his father-in-law, the skillful and energetic admiral, Romanus Lecapenus (919-44). In the year 944 the sons of Romanus Lecapenus forced their father to abdicate and retire to a monastery, and declared themselves emperors. They were deposed in 945 by Constantine Porphyrogenitus, who ruled independently from 945 until 959. His son, Romanus II, reigned only four years (959-63), leaving at his death his widow Theophano with two minor sons, Basil and Constantine. Theophano married the capable general, Nicephorus Phocas, who was proclaimed emperor (Nicephorus II Phocas, 963-69). His reign ceased when he was slain, and the throne passed to John Tzimisces (969-76), who claimed the imperial title because he had married Theodora, a sister of Romanus II and a daughter of Constantine VII Porphyrogenitus. 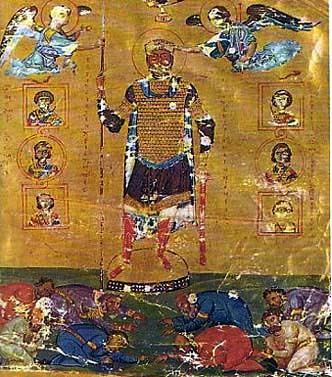 Only after the death of John Tzimisces did the two sons of Romanus II, Basil II, surnamed Bulgaroctonus (the Bulgar-Slayer, 970-1025) and Constantine VIII (976-1028), become rulers of the Empire. Administrative power was concentrated mainly in the hands of Basil II, under whom the Empire rose to its highest power and glory. With his death began the period of decline for the Macedonian dynasty. After the death of Constantine VIII the aged senator, Romanus Argyrus, married to Constantine's daughter, Zoe, became emperor and ruled from 1028 until 1034. Zoe survived him, and at the age of about fifty-six married her lover, Michael the Paphlagonian, who was proclaimed emperor at his wife's entreaty, and ruled as Michael IV the Paphlagonian from 1034 to 1041. During his reign and in the brief reign of his nephew, Michael V Calaphates (1041-42), another accidental and insignificant figure, there was much disturbance and acute discontent in the Empire, which ended in the deposition and blinding of Michael V. For about two months the Byzantine Empire was ruled by the unusual combination of authority in the hands of Zoe, widowed for the second time, and of her younger sister, Theodora. In the same year 1042 Zoe married for the third time, and her new husband was proclaimed emperor. He ruled as Constantine IX Monomachus from 1042 until 1055. Zoe died before her third husband, but Theodora survived Constantine Monomachus and became the sole ruler of the Empire after his death 1055-56). After the reign of Irene, the famous restorer of image worship at the end of the eighth and early ninth centuries, the rule of Zoe and Theodora marks the second and last instance of feminine rule. Each of them occupied the throne as the autocratic and sovereign basilissa, i.e., Empress of the Romans. Shortly before her death Theodora yielded to the demands of the court party and elected the aged patrician, Michael Stratioticus, as her successor. 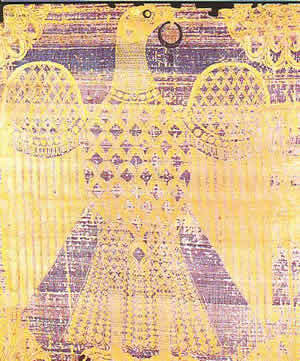 He ascended the throne after Theodora's death in the year 1056. Theodora was the last ruler of the Macedonian dynasty, which occupied the throne for a period of 189 years. Vasiliev, following the Bulgarian writer Zlatarsky, considers Czar Samuel as Bulgarian, but Ostrogorsky presenting and evaluating all evidence on Samuel's origin and ethnicity had shown that such "assertion has not the slightest foundation in the sources". Vasiliev however did acknowledge that Samuel's empire was not Bulgarian, but rather Sloveno-Macedonian with the following : "The hypothesis has recently been set forth that John Tzimisces conquered the whole of the Bulgarian Empire, both west and east, and that only after his death, during the internal troubles in Byzantium, did Samuel revolt in the west and succeeded in establishing his Sloveno-Macedonian Empire" (p.319). In that regard, his view aligns with Ostrogorsky's analysis.